This quote sums up the attitude behind the music of blues/rock guitarist-vocalist Rick Fowler. His musical honesty creates an unsurpassed morphic resonance between him and his listeners. With Rick, it's never about notes-per-second, phony emotion, or conjured-up glory; it is a true elation shared by both musician and audience. Superb musicians and a record label that puts the music first helped Rick capture this magic on tape with his new CD, Back on My Good Foot. Among others joining him on the album are Randall Bramblett (Hammond organ), Gerry Hansen (drums) and Michael C. Steele (bass and backing vocals) - all members of the Randall Bramblett Band - as well as original R.E. M. drummer Bill Berry, who guests on the song, "Road to Nowhere." Back on My Good Foot embodies both raw blues at its core and British-style blues/rock at its most powerful. The new CD showcases nine original songs, most written or co-written by Rick Fowler, as well as a 10-minute rail-shaking version of the Savoy Brown classic, "Hellbound Train." The CD was recorded at several studios in Atlanta and Athens, Georgia, and produced by Pat Patten. Adding his deft touch in mastering Back on My Good Foot was Rodney Mills, whose credits include multiple Atlanta Rhythm Section albums and Gregg Allman, among many others. "In today's world, most CDs are recorded with the idea that both the music and the artist will fit an existing image created by a group of advertising people," says Rick Fowler in the album's liner notes. "Every now and then, someone comes along who does not care about the latest trend but rather is interested in capturing sincere emotion and letting music be what it should be; a superior form of communication between humans. The idea is not to dupe the audience; it is to communicate with them." "This record does not contain a note that was not honestly felt by those involved. The recording strategy of this CD was simply to put musicians and producers who all like each other in a studio and let it happen. It happened beautifully for us and we hope that you, the listener, will feel the same love that we did." 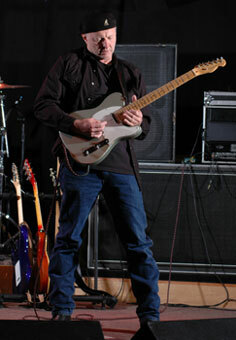 Rick Fowler has been playing guitar and singing in bands since the age of 12. He learned to play primarily by listening to early British blues/rock guitarists and American blues players. He has performed with some of the world's top musicians and toured much of Europe and The Mediterranean. Although he has played a number of musical styles with various artists, his deep blues roots can always be clearly heard. Fowler's earlier bands included Ziggurat, Deacon Little, and Fortnox. Fowler also recorded with pop singer Bertie Higgins, whose hit single, "Key Largo," reached platinum sales in several countries. In 1982, the Fortnox song, "Storm Inside My Head," went to number 44 in US airplay and the band's video reached the top 20 on MTV. The band toured non-stop for a year in support of the record, headlining medium venues and performing in stadiums as the supporting act for such top rock acts as Aerosmith, Cheap Trick, George Thorogood, Joan Jett, The Ramones, The Outlaws, Johnny Van Zant, April Wine, Pat Benetar, and dozens of others. In 1984, Rick's band Bombay recorded an album with legendary British producer Eddie Offord (of John Lennon, Yes, and Emerson, Lake, and Palmer fame) supported by the MTV video, "Rumble Tonight". Rick moved to Athens, Georgia, in 1991 after months of touring overseas with the band Bad Fun. He began performing with a number of Athens-based artists, including Ralph Roddenberry, Redneck Greece and The Lonely White Boys (a band he formed with Drivin' N' Cryin' guitarist Buren Fowler, Dreams So Real drummer Drew Worsham, and Normaltown Flyers bassist Greg Veale). He also regularly played guitar in side band projects with Bill Berry (R.E.M. ), Dave Schools (Widespread Panic, Government Mule), Randall Bramblett (Sea Level, Traffic), and a number of other top musicians from the area. With a desire to create a musical endeavor to help support a good cause, Rick put together a band of well-known musicians to perform the first rock concert benefit for Tourette Syndrome awareness. Bill Berry, who was at the time retiring from the mega-star band R.E.M., made the show his farewell performance, allowing his drums to be auctioned off for charity at the end of the night. The event received international coverage including MTV, CNN, VH-1, AOL, Rolling Stone, Spin and a number of other music news outlets. Welcome Companions, a CD recorded by the benefit concert band, was released by Polyglot Records under the band name Rick Fowler and Friends. Prior to signing with Jammates Records in 2007, Rick played guitar on dozens of CD projects, performed hundreds of shows spanning three countries, and produced and performed the music track for the Sundance Film Festival award-winning movie Dirty Work. In 2006, he got a chance to record with one of his earliest influences; Roland Janes (guitarist for Jerry Lee Lewis and other 50s hitmakers) in Memphis, TN at Sam Phillips Recording. "Classic white boy blues guitarist that's happy to be a well regarded journeyman in search of the ultimate riff - the kind of cat that knows his stuff but doesn't make a big deal out of it. He lets the good times roll." "As a writer, Rick Fowler pens songs that reach out and literally grab the listener by the lapels. Add to that his stinging guitar attack and a red-hot backing band, and Back On My Good Foot makes for a highly-recommended listen!!!" "With so many blues guitarists aping the Vaughns, it's refreshing to hear somebody wear his British blues influences on his sleeve."